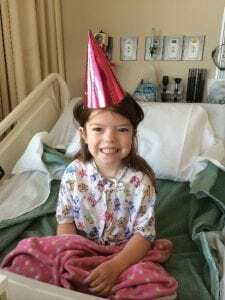 Meet Maelle: the 2018 Children’s Hospital Colorado 2018 CMN Champion! Eight-year-old Maelle bounces on her tippy toes to the sound of a Spice Girls song coming from her mom’s iPhone. She steps from side to side with her hands up in the air, being extra careful to not knock out her IV. Every so often she’ll look over at her mom and dad with a smile as she wiggles her hips. It has been a long day of testing at Children’s Hospital Colorado, and the family is taking a break to have a dance party. It’s a welcome distraction from the hard realities the family has faced in recent years. Maelle lives with a benign tumor located on her optic nerve. Because of its precarious location, the tumor is inoperable. 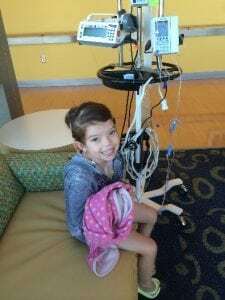 Maelle will have to continue treatment at Children’s Colorado to manage its growth. They first discovered the tumor four years ago when Maelle complained that her head hurt and her eyes started crossing. Doctors in their hometown of Greeley, Colo., discovered a 3-centimeter mass in her brain and immediately sent the family to Children’s Colorado where Maelle had a biopsy. Doctors determined the tumor was not cancerous, but they still needed to shrink it to prevent impacting Maelle’s vision or causing headaches. dance performances for her care team, often drawing crowds of 15 or more. outside of the hospital and become an avid volleyball player. But unfortunately, at a quarterly check-up in March of 2018, doctors discovered that Maelle’s tumor had started growing again, necessitating additional treatment at Children’s Colorado. Maelle is currently undergoing multiple tests to determine the best way to manage her tumor this round. Doctors are doing everything they can to shrink the tumor as much as possible, but the reality is that they likely will never be able to remove it, and Maelle will probably have to manage it throughout life. It’s not an easy path, but from routine blood draws to chemotherapy, Maelle continues to sing and dance through it all. In the meantime, they find comfort knowing they’re in the best place possible. The family also has hope in the groundbreaking research being conducted at Children’s Colorado to find new treatments and therapies for kids like Maelle. Next post: Northwest Golf Classic Raises over $1.4 million!